You can’t expect to meet the challenges of today with yesterday’s tools, and expect to be in business tomorrow. 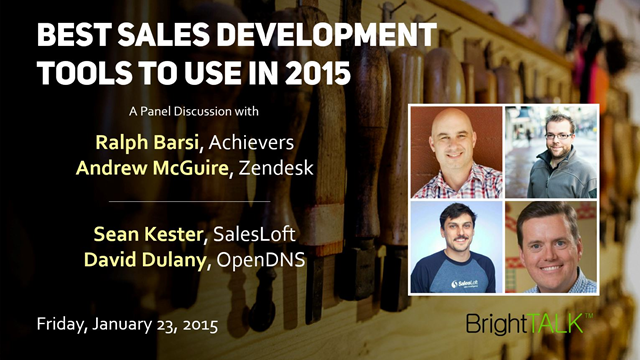 This discussion centers on the best Sales Development tools to use in 2015, so you can drive quality pipeline and have a winning year. Join Ralph Barsi, Senior Director of Sales Development (Achievers), as he hosts a panel of Sales Development leaders sharing the most effective tools for your Sales efforts. Getting a customer’s attention and their buy-in to your solution is critical to your success. Yet most salespeople are doing things in the conversation that is taking from that objective. As leaders, salespeople need to create an environment that is safe for their customers and one that motivates them to participate in the RIGHT conversation. Doing this correctly will help you increase your closing ratio and identify new opportunities. In this interactive webinar, Ron Karr will provide simple strategies and tactics on how you can get your customer’s attention and buy-in. He will model it for you and explain why it works based on the latest neuroscience findings. You will be amazed at how simple it really is. Let’s push past the hype and the BS and look at the facts: Artificial intelligence has evolved to the point where any sales organization that leverages AI will see measurable improvements in customer engagement, LTV, and overall sales. AI can take on the simplest tasks, like automation of admin work such as activity logging, flagging high-priority emails, and managing contacts in your CRM. It can swiftly and accurately sift through leads, deals, and accounts to identify what’s actually worth your time, and dynamically identify which leads are ready to convert. It’ll help you ditch the sandbagging with accurate quarterly forecasting — and more. To learn more about how to sell smarter, harder, and more with AI, how to seamlessly integrate the technology into your organization, and to learn of real-world results from leading brands, don’t miss this VB Live event! * What's next for AI and sales? The way we attract, develop and retain top talent today is far more strategic than ever before. Why evaluating sales people for your team, you must look beyond the skills on paper and understand how they fit into the big picture – today and in the future. This program will give tips for building the candidate pipeline in a large scale strategic way and engaging sales teams to align with your business with every sale. Fred Diamond and John Asher discuss latest updates on the explosion of neuroscience studies on human communications and decision making. All of these research and study results have a direct application to sales. Attendees will have specific implementable action items that will make an immediate impact on their closing rates. Customer Success is not the same as Customer Service or CX. Customer Success is about getting ROI and value for your customers, at every touch point with your organization. It's a tall order, but leading companies are committed to customer obsession. Learn more about Customer Success from the CEO of Totango in this panel discussion moderated by Deb Calvert and with innovative ideas from Sales Expert Tim Hurson. You'll see post-sale processes and customer relationships in a whole new way! - Our customer success managers are all former sales reps.
- Customer success managers lead our product test drives. - We are our own customer: our customer success team owns our sales team’s successful use of our own product. Everyone wants to improve Sales Productivity or "Revenue Per Rep." It's often a struggle, because the way we approach training and enabling reps is ineffective and doesn't support behavior change. In this webinar, Mike Kunkle will share how a new systems approach to Sales Enablement will radically improve your results. Inbound marketing works, inbound sales works…but independently they can only go so far. Learn how to plan an inbound strategy that keeps your sales & marketing teams on the same page, working towards the same objectives, and most importantly setting them both up for success. LinkedIn is a powerful and underutilized tool for sales professionals. The B2B market is shifting, and your approach to growing pipeline with sales development needs to shift along with it. Industry experts agree that playbooks from early 2010s won't cut it today. Laurie Page, Managing Partner for the Bridge Group, will cover the top four strategic sales development trends happening today and how to leverage them for success. Join us for this session to gain higher growth in 2018 and beyond! Welcome to The Sales Experts Channel! We are a community of sales authors, trainers, researchers and thought leaders collaborating here to answer your questions about how to sell more effectively. After working in the entertainment industry for over 13 years as a former American Idol contestant, he is now an inspirational speaker. He has used outbound marketing strategies in order to earn speaking opportunities to proactively grow his speaking business. Although the benefits for inbound marketing strategies are well-documented, it is difficult to implement without an established brand for your company. This is where outbound marketing strategies can help you start the first conversations to build relationships with potential clients. Finding the right niche for a new business can require significant amount of trial and error. Therefore, reaching out to more prospects to generate leads is a sound strategy. Also, outbound marketing is necessary to build rapport with new decision makers. However, in order to be successful with outbound marketing, it is critical to have the right sales cadence and the right amount of human touch. Being the best at what you do, doesn’t guarantee success anymore, innovators can enter a market and turn it on its head. We will explore where the ideas for the disruption come from and how you can disrupt through great questions. It’s better to be the disrupter than the disrupted. Ever wonder why someone isn’t buying from you even though you know they need what you have? The answer lies in understanding their motivation and personality types. In this presentation, you will discover how to determine what drives your buyers decision-making so you can make more sales, faster. As we've brought DocSend to market, we've experimented continually with every stage in the sales process to improve our productivity. In this webinar we'll share what we've learned, with the goal of providing actionable tactics and strategies you can use immediately to optimize your sales process. New in 2017! Wondering what all the fuss is about? Tune in to find out what these 64 sales trainers, authors, researchers and thought leaders have been up to in creating The Sales Experts Channel. Deb Calvert will explain the community mission, introduce you to the Sales Experts, and preview upcoming content. Bonus materials and giveaways for all who subscribe to the Channel by the end of this live webinar! An overview of BrightTALK and its platform. Sales management, training, enablement, hiring, incentivizing... Everything you need to know to lead your team and company to success.